Audio 456 THPR-2 two pak and receive (1) 2 oz. 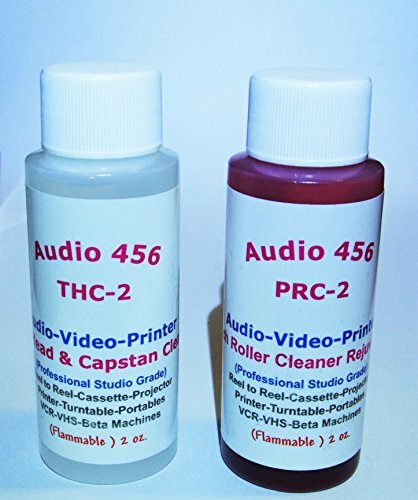 Audio 456 tape head and capstan cleaner and (1) 2 oz. bottle of high performing Audio 456 Magic Pinch Roller Cleaning Conditioner Rejuvenator that will gently clean and condition any make model rubber pinch rollers to a nice velvety at touch feel ---- Formulas are of a Grammy winning producer / engineer who made up this formula for his personal use , with over 50 years of recording professionally.The Audio 456 Tape Head and Capstan Cleaner Fluid and Pinch Roller Cleaner do not contain water like rubbing alcohol does. Tape Head Cleaner Does Not Leave a Residue Formulated for safe use with all brand and model Reel to Reel,Cassette Deck,Mini Cassette Decks,Answering Machines,Sound Projectors,Tape Echo's,Portable Tape Decks,Digital Tape Decks,Turntable idlers ect ect. If you have any questions about this product by Audio 456, contact us by completing and submitting the form below. If you are looking for a specif part number, please include it with your message.